China Post is the official postal operator of China. The company offers a wide range of services, including domestic and international standard mail and parcel delivery, express delivery, financial services and logistics. China Post is based in Beijing and is owned by the Government of China. Items send with China Post can be tracked when delivery confirmation is purchased when the item is sent. To track and trace letter-post and parcel-post items, visit intmail.183.com.cn. China Post’s online track and trace service is only available in Chinese. 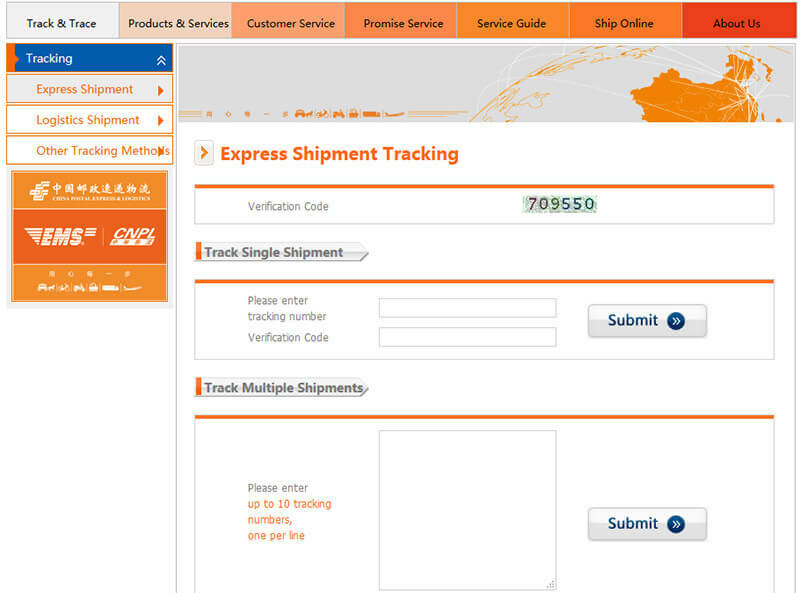 China Postal Express & Logistics also offers a range of tracking tools for express mail shipments. The company offers online Express Shipment Tracking and Logistics Shipment Tracking tools. In order to track a shipment, a valid tracking number and verification code is required. Tracking information is available for up to one year for domestic shipments and for up to four months for international EMS shipments. In addition to online tracking, items sent with China Postal Express & Logistics may be tracked by calling the company’s Customer Service Hotline at +8610 11183. Shipments can also be tracked at the local post office where the EMS item was sent. China Post serves mainland China and is the official postal service of the People’s Republic of China. The postal service is owned by the State Post Bureau of the People’s Republic of China, a government agency that was formed in 1949. The agency manages China Post and other national postal enterprise. It also as regulates the country’s postal industry, including the services provided by China Post. Postal service in China traces its roots to the Shang Dynasty. The Customs Post Office was first established in 1878 under the Qing Empire. It became the Great Qing Post in 1896. In 1911, the postal service emerged as a stand-alone body independent of the customs service. It was renamed to Chunghwa Post in 1912 and functioned as mainland China’s main postal service until 1949. The postal service was replaced in 1949 by China Post. The China Post Group was formally established in 1997. China Post is part of the China Post Group, which is solely owned by the Chinese government. The Ministry of Finance is responsible for administering the state-owned assets of the China Post Group, while China Post Group is responsible for maintaining and increase the value of state-owned assets. The group is authorised to establish postal corporations within provinces, autonomous regions and municipalities in China. The China Post Group provides both domestic and international mail delivery services, as well as the circulation of newspapers, journals and books. It is also responsible for issuing stamps and producing and selling philatelic collections. The group also provides postal remittance services, postal financial services, postal express delivery and logistics services, confidential correspondence communication, and other related services. 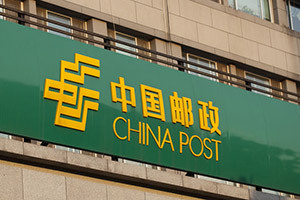 The China Post Group includes a wide range of subsidiaries, including the Postal Savings Bank of China, the China Postal Express and Logistics Corporation, the China National Philatelic Corporation and the China Postal Airlines Corporation. The group also owns the China Post Life Insurance Company, the Information Technology Bureau of China Post Group, China Post Securities, the Postage Stamp Printing Bureau of China Post Group, and the China Post Xintong Industrial Investment Corporation. The China Post Group also includes the Postal Science Research and Planning Academy, the Shijiazhuang Posts and Telecommunications Technical College, the China Postal Culture and History Centre, the Data Media Centre of China Post Group, and the Shanghai Postal Service Science and Research Institute. According to the 2012 China Post Group Annual Report, the group’s business revenue was 321.35 billion yuan in 2012. This represented an increase of 24.2 percent over the previous operating year. The group employs approximately 927,800 people. It operates about 24,000 postal routes covering some 5.86 million kilometres throughout the country. The China Post Group also has a fleet of approximately 76,000 vehicles. China Post operates 11185.cn, an online shop with a range of self-service products including stamps and other post-related items. The site is also available for finding airfares and other convenient services. It is also available for purchasing express mail service (EMS) products. The online service is currently only available in Chinese. China Post serves some 600,000 villages across China and handles approximately 7.07 billion pieces of mail, according to the 2012 China Post Group Annual Report. On average, each of the company’s approximately 47,000 service outlets serves about 29,000 people and covers 203 square kilometres. Delivery times within China are generally two days within urban areas and five days in rural areas. Rates for items sent domestically within China depend on the weight and type of item. For postcards, the standard rate is RMB 0.80 for items within mainland China. The rate for postcards to Taiwan, Hong Kong and Macau is RMB 1.00. Rates for letters start at RMB 0.80 for letters weighting less than 100 grams and RMB 1.20 for letters weighting more than 100 grams. For letters sent to Taiwan, Hong Kong and Macau start at 1.50 for up to 20 grams. Rates for letters sent to these territories weighting more than 20 grams start at RMB 2.80. Global Priority mail for small envelopes weighting up to 500 grams is RMB 18. For larger envelopes with a maximum weight of 1 kilogram, the rate is RMB 30. This service is available for sending items to Taiwan, Hong Kong and Macau. Additional products such as registration, delivery confirmation and insurance coverage are also available for a fee when sending any item within China or to Taiwan, Hong Kong and Macau. To obtain a domestic postal rate, visit zf.chinapost.com.cn (only available in Chinese). For international letter-post, China Post offers airmail and surface options. Airmail to countries that neighbour China is available at RMB 20 for items weighting up to 20 grams, as of August 2014. Each additional 10 grams is charged RMB 1. Countries include the Republic of Korea, the Democratic People’s Republic of Korea, Mongolia, Japan, Vietnam, Tajikistan, Turkmenistan, Kazakhstan and Turkmenistan. Sending larger items to these countries is RMB 14 for items weighting up to 100 grams and RMB 325 for items up to 5 kilograms. Rates for sending an item to other destinations via airmail start at RMB 5.50 for up to 20 grams and RMB 16 for up to 100 grams. The price for sending Surface International Letter-post starts at RMB 3 for items weighting up to 20 grams and RMB 7 for items up to 100 grams. Additional charges apply for items over standard weights. Sending an International Small Packet up to 100 grams is RMB 14 to destinations in certain neighbouring countries. An additional charge of RMB 9 is applied for each 100 gram over the standard weight. Rates for other countries start at RMB 16 and depend on the destination and weight of the small parcel. For small packets sent by surface letter-post, rates start at RMB 7 for items up to 100 grams. An additional fee of RMB 4.50 is charged for each additional 100 grams. China Post also offers a Global Priority Mail option for international mail. The service is available for RMB 40 when sending small envelopes weighting up to 500 grams. The rate for large envelopes up to a maximum weight of 1 kilogram is RMB 70. China Post also offers a range of value-added options, including insurance cover, delivery confirmation and registered mail. To obtain a quote for sending an international letter or parcel with China Post, click here. The Postal Savings Bank of China is a full-service commercial bank with approximately 37,000 savings branches. The bank offers comprehensive and conventional financial services throughout China. It also operates approximately 20,000 business offices for international remittance services and 45,000 branches with exchange services. The Postal Savings Bank offers a range of financial products, including foreign currency financial products, foreign currency deposit product agreements and foreign currency exchange services. Banking products include savings accounts and term-deposit savings accounts. Through a partnership with Western Union and other foreign banks, the Postal Savings Bank also provides a remittance service network that spans more than 200 countries and territories around the world. For more information about the Postal Savings Bank, visit www.psbc.com (only available in Chinese). China Post began international express mail services in 1980 and domestic express mail in 1984. In 1985, the China Courier Service Company was established as the country’s first professional express company. In 1987, the company was re-launched as China Express. The China Post expanded into logistics in 2000 with a new truckload freight service and founded the China Post Logistics Corporation in 2003. The China Postal Express & Logistics Company was founded in 2010. Handling mail to 200 countries and territories, China Postal Express & Logistics is the largest integrated express and logistics service provider in China. The company has approximately 100,000 employees and 31 provincial subsidiaries. It also operates China Postal Airlines, which was founded in 1995 as the first domestic cargo airline in the country. China Postal Express & Logistics is responsible for domestic and international express services. It is also responsible for logistics and less-than-truckload (LTL) freight transport. Express services include economy, standard and premium products with varying delivery times. Value-added products are also available, including cash-on-delivery (COD). The company is also a member of the EMS Collective and provides EMS branded express mail products. It also offers a domestic brand of logistics services under the CNPL banner. For information about China Postal Express & Logistics, visit www.ems.com.cn. Next Morning Deliver is the premium EMS product provided by China Postal Express & Logistics. Leveraging the company’s overnight flight network, the service includes Regional Next Morning Delivery and Trans-regional Next Morning Delivery. Regional Next Morning Delivery is available within the Yangtze River Delta, Bohai-Rim, the Pearl Delta, Northeastern China and Southwestern China. Letters and parcels must be less than 30 kilograms for delivery in the Pearl Delta and less than 5 kilograms in other areas. The price for the service within the Yangtze River Delta, Bohai-Rim, Northeastern China and Southwestern China is RMB 20 for the first 500 grams and RMB 6 for each additional 500 grams. For shipments in the Pearl Delta, the price is RMB 16 for the first 500 grans and RMB 2 for each additional 500 grams. Trans-regional Next Morning Delivery is available Monday to Friday between major cities in China, including Beijing and Shanghai. The service is also available in Chengdu, Dalian, Dongguan, Foshan, Fuzhou, Guangzhou, Haikou, Hangzhou, Jiangmen, Nanjing, Qingdao, Shenyang, Shenzhen, Suzhou, Tianjin, Wuhan, Wuxi, Xiamen, Zhongshan and Zhuhai. The price for the service is RMB 50 for the first 500 grams. Each additional 500 grams when shipping within Bohai-Rim and the Pearl Delta is RMB 15, while other areas the rate is RMB 10. Prices may vary in different local markets. Domestic Economy Express is designed for the domestic retail market, including online retailers. The service is available in large cities and some counties. Domestic Economy Express is offered for shipments to almost anywhere in China, with the exception of Tibet, Hainan and Xinjiang. The service includes door-to-door pick-up and delivery. Delivery times are slightly longer than the Domestic Express option. Prices start at RMB 12 for the first kilogram and depend on the destination (that is, distance) and weight. Other domestic options include the Domestic Express Service, a premium EMS product for faster delivery. The service is designed for sending important documents and parcels, including merchandise. It is available in nearly 2,000 cities and counties across China for inter-city and intra-city express shipments. The rate for Domestic Express is RMB 20 for the first 500 grams. Rates depend on the weight of the item and destination. Alternatively, Domestic Expedited Parcel is a more affordable land-based service for sending parcels throughout China. Domestic E-Commerce Express is designed for individuals and businesses involved in online selling and e-commerce. In addition to providing a basic shipping and delivery service, this option provides value-added services such as warehousing, sorting and cash-on-delivery. For intra-province, rates begin at RMB 10 for the first kilogram. Rates for sending items between provinces start at RMB 15 and depend on the distance and weight of the parcel. To obtain a quote for a domestic express rate, click here. International Express Mail Service is China Postal Express & Logistics’ EMS product. This service is intended for urgent letters, documents, parcels and other items to destinations around the world, including Taiwan, Hong Kong and Macau. Prices for the International Express Mail Service depend on the weight and destination and start at RMB 90 for the first 500 grams. In addition to delivery, value-added products are also available including packaging, customs clearance and insurance coverage. The service is provided in partnership with postal operators that are members of the EMS Collective. China International Express is an international express service provided by China Postal Express & Logistics and international postal operators that are not members of the EMS Collective. Fully traceable and tracked, the service is available for delivery to more than 200 countries and territories. For different shipping times, China International Express options include Standard Express and Economy Express. The rates for sending an item with China International Express depend on the destination and the weight of the parcel. International Parcel is offered for standard delivery of parcels to worldwide destinations. The service includes an Air Parcel option for parcels sent by air and Surface Air Parcel for items shopped by sea and land. International E-Commerce Express is an economy express service for lightweight parcels sent overseas. The service is available in most major cities, including Beijing, Shanghai, Dongguan, Foshan, Fuzhou, Guangzhou, Hangzhou, Jinhua, Nanjing, Ningbo, Putian, Qingdao, Shenzhen, Suzhou, Taizhou, Tianjin, Wenzhou, Xiamen, Zhangzhou and Zhongshan. Rates start at RMB 6 for the first 50 grams and RMB 0.12 for each additional gram. The maximum weight per parcel is 2 kilograms and delivery is within seven to ten days. To obtain a quote for an international express rate, click here. China Postal Express & Logistics offers contract logistics service with integrated solutions that leverage the company’s national air and land networks. Solutions also use the company’s warehousing facilities, information technology system and quality assurance system. The company acts as a lead logistics provider (LLP) and delivers logistics design, consultation and outsourcing services. It also provides inbound logistics utilising vendor management inventory (VMI), just-in-time (JIT) and milk-run strategies. China Postal Express & Logistics also offers distribution logistics, including storage and distribution, transportation and delivery services. It also provides sales support and after-sales logistics such as parts storage and distribution and call centre services. The company also designs industry-specific logistics solutions for clients. China Postal Express & Logistics delivers LTL services for small and medium sized enterprises. The company offers basic logistics services including door-to-door pick-up and delivery. It also offers international freight forwarding with commercial customs clearance and value-added services such as bonded logistics. This freight service is available with sea, air and land shipping. To contact China Post, write to No.3 Financial Street, Xicheng District, Beijing, 100808, China. contact China Postal Express & Logistics, write to No. 14, TaipinghuDongli, Xuanwumen West Street No.127, Xicheng District, Beijing, 100031, China. Alternatively, email China Post at feedback@chinapost.com.cn. By phone, postal services may be reached by calling +8610 11185. For courier and logistics services, call China Postal Express & Logistics on +8610 11183. For Postal Savings Bank, call +8610 95580. More information about China Post is also available online at english.chinapost.com.cn. I have send a package from Shanghai to Germany on the July 04. After 10 days it arrived to Germany, but couldn’t been delivered. The address is correct and the name tag is even on the door. (i have send it to the company). Even no call was made. At the same day my package was send back to Frankfurt and then to China. Could you please explain it.